Gérard PESSON: Forever Valley (2000). Judith Henry (voice), Salima de Coudenhove, Jody Pou (sop. ), Sandra Raoulx (mezz. ), Pascal Sauzy (ten. ), Vincent Bouchot, Paul-Alexandre Dubois (bar. ), Kamil Tchalaev (bass), Pierre Lassailly (clar. ), Pierre-Stéphane Meugé (sax. ), Kristina Kuusisto (accordion), Caroline Delume (guitar), Fanny Paccoud (violin), Elena Andreyev (cello), Vincent Leterme (cond.). Assai 222322. This is an exciting discovery. In terms of significance, Gérard Pesson’s opera Forever Valley belongs with Sciarrino’s Luci mie traditrici and Lachenmann’s Das Mädchen mit den Schwefelhölzern. Derived from an eerie text by Marie Redonnet, which the booklet excerpts in French and English, Forever Valley depicts a girl’s coming of age in a moldering environment: To occupy her days, the heroine digs holes in a church garden hoping to find corpses. Suggesting Boris Vian or a thigh-baring Beckett, the chamber opera unfolds in 25 terse movements. Pesson’s fragile universe resourcefully utilizes a small chamber ensemble. Saxophone and accordion offer breezy flumes only to be cancelled by atmospheric strings and shuffling noises. The vocalists are frequently massed, and the spoken voice alternates between narrator and character. Now and again a solo voice will emerge only to vanish among delicate guitar harmonics and a breathy clarinet. Short gestures repeat like nervous fidgeting. Where Sciarrino and Lachenmann may appear harsh, Pesson’s world glitters like falling snowflakes. A disturbing cover photo sets the mood: Surrounded with leaves, a naked woman with saucer-like eyes covers her breasts with her hands. Is she shielding herself from us, or is she restraining herself? It may be hard to find this or anything by Pesson in the US (Dominique My leads Ensemble Fa in a potpourri of equally delicate chamber works and miniatures on Accord 204682, reissued as Accord 465 798-2). Universal.fr, amazon.fr and fnac.fr are good sources. Johannes BRAHMS: Serenade No. 2 in A Major, Op. 16 (1858-59); Symphony No. 3 in F Major, Op. 90 (1883). London Symphony Orchestra, Bernard Haitink (cond.). LSO0056 (http://www.lso.co.uk/). Distributed in the US by Harmonia Mundi (http://www.harmoniamundi.com/). This Second Serenade is perfect. I’ve been hunting for good Brahms serenade recordings for years. Usually they’re taken up by ensembles that would have done better sticking with Benda and Boyce. Written in his late twenties, just after Robert Schumann died and while reflecting upon his relationship with Clara, Brahms’ two serenades reveal a composer not yet daunted by Beethoven’s legacy. Like Dvorak’s serenades, these carefree pieces reflect a bittersweet fondness for older forms. Serenade No. 2 is for winds with violas, cellos and basses. The Londoners take the five movements magisterially. The intonation is faultless, the balance warm. I’ve found Brahms’ Third elusive, largely owing to its less than well-defined character. Here, too, wind solos are perfect, the third movement horn solo like butter melting on bread. It’s probably because upper strings are absent from the Serenade that they sound slightly aggressive in the subsequent Third. 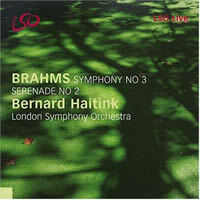 The LSO’s Brahms cycle under Haitink is a must-have. So far, on their LSO Live label, they’ve released the First with the Tragic Overture (LSO0045) and the Second with Gordan Nikolitch and Tim Hugh in the Double Concerto (LSO0043). A Fourth is probably imminent, although there may be intervening discs with the other concertos, the Haydn Variations, Academic Festival Overture and — what I’m most eager to hear — the First Serenade. I don’t have to repeat Haitink’s Brahms credentials. Here are well-proportioned, committed and sensitive performances, neither stodgy nor treacly. Get them now. “The Concerto Project Vol. 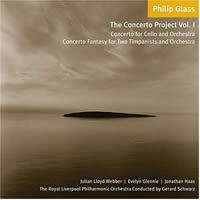 1.” Philip GLASS: Concerto for Cello and Orchestra (2001); Concerto Fantasy for Two Timpanists and Orchestra (2000). Julian Lloyd Webber (cello), Evelyn Glennie, Jonathan Haas (timpani), Royal Liverpool Philharmonic Orchestra, Gerard Schwartz (cond.). Orange Mountain Music 0014 (http://www.orangemountainmusic.com/). Buckle up! The booklet hints at more discs devoted to Glass’ concertos (including works for piano, violin, harpsichord and saxophone quartet). A reluctant Glass fan, I like these two with their vivid colors and grinding rhythms. Sure, Glass is a minimalist, but he maximizes his orchestration, though there’s little music here. We’re hearing puckishly rearranged raw materials: Arpeggiated triads, twos against threes, and quarter-half-quarter beat patterns are restacked and pushed around like warehoused cartons. Julian Lloyd Webber smears his blurred intonation throughout the mildly downhearted Cello Concerto. It’s funny how the cutting saxophone in Nyman’s Double Concerto (EMI CDC 5564872) masks Webber’s adenoidal timbres. Like runway couture, it may be nice to look at (or through), but you wouldn’t wear it to walk the dog. After the Cello Concerto’s sober pessimism, the 14-drum Concerto Fantasy is an optimistic barrage, almost arrogant with its opening 3+3+2+2 swagger. Pardon me for not knowing my 1970s pop music, but the piccolo brings an Austin Powers feel to the first movement’s frisky tuttis. Clever glissando effects illuminate a cadenza. I keep expecting the drums to erupt. After the last beat fades away, one realizes that there’s more drama in Nielsen’s Inextinguishable timpani battle. Schwartz and the Royal Liverpool Philharmonic Orchestra nail this music. Smart and goofy, these concertos suit me better than a recent disc of symphonies (Nos. 2 and 3 on Naxos 8.559202 with Marin Alsop and the Bournemouth Symphony Orchestra) or Bang on a Can’s recent gallop through Music in Fifths and Two Pages (Cantaloupe CA21016). Gustav MAHLER: Symphony No. 10 (1910, incomplete; Barshai ver. 2000? ), Symphony No. 5 (1901-2). Junge Deutsche Philharmonie, Rudolf Barshai (cond.). Brilliant Classics 92205 (http://www.brilliantclassics.com/). Distributed in the US by Qualiton (http://www.qualiton.com/). With two admirable performances at budget price, here’s a no-brainer for the Mahler nut. Instead of historical background, the booklet replays adulations for the Fifth’s original 1999 Laurel release. It’s a deserving recording. The Junge Deutsche Philharmonie’s high-achieving youth deliver an energetic performance. The second movement conveys the appropriate impact. The Adagietto is heavenly without being sugar-coated. The long horn solos of the hyper-extended Scherzo never fail, and everywhere Barshai’s pacing satisfies. What the young players lack is expressive depth, most tellingly in the Rondo-Finale, which grows wearisome with its forced optimism and busybody fuguing. This Tenth is unique. Recorded on September 12, 2001, world events helped the musicians find the emotions they lacked for the Fifth. The opening Adagio soars and crests. The players’ feelings turn menacing, appropriate for the scherzos but not for the Purgatorio. Again Barshai finds the right momentum. His reconstruction will not startle, except for a few odd passages such as in the first scherzo where a temple-block rattles lightly and at the movement’s end where non-pitched drums suggest Xenakis. The second scherzo most audibly diverges from Cooke, Wheeler and Carpenter when Barshai adds colorful secondary textures and counterpoints. Shostakovich covers Ravel elsewhere. The notes offer few clues as to the nature of Barshai’s labors, except to remark that completing Mahler’s Tenth was a lifelong passion. 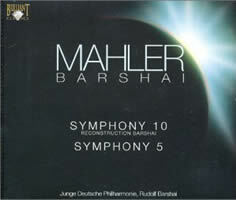 One passage raises eyebrows: “In Rudolf Barshai’s version it becomes much more clear that Mahler’s intention was to reconcile Western thought with the Buddhist idea of the eternal return.” I’m not so sure about that, but like the Fifth, the music speaks for itself. “Harvard Composers.” Walter PISTON: String Quartet No. 1 (1933); Leon KIRCHNER: String Quartet No. 2 (1958); Earl KIM: Three Poems in French (1989); Bernard RANDS: String Quartet No. 2 (1994); Mario DAVIDOVSKY: String Quartet No. 5, “Denk an Opus 132” (1998). 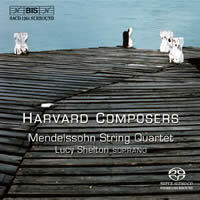 Mendelssohn String Quartet, Lucy Shelton (sop.). BIS 1264 (http://www.bis.se/), also available in SACD format. Distributed in the US by Qualiton (http://www.qualiton.com/). Fancy a leading Swedish label releasing a disc devoted to Harvard composers. Would any American major consider such a project? If they heard the Mendelssohn String Quartet perform, they’d probably let them record anything. The Mendelssohn’s expert playing washes away any doubts about the music. Piston’s angular three-movement Second is an early work, less didactic and straight-laced than most of his symphonies. Kim locates rich expression in Verlaine and Baudelaire, Lucy Shelton floating over the quartet in plain lines. Leavened with ample solo exposures, the stark writing in Rands’ distinctive two-movement Second reveals the Mendelssohn’s impressive cohesion. Kirchner’s Second, with its aching expressionism, seems the least defined. Davidovsky, well-known for his Synchronisms series pairing instrumental soloists with tape, considers Beethoven with his all-instrumental Fifth, though I hear more Webern and Schoenberg in the expressive, explosive writing. Presumably the intervening centuries have influenced how we’re supposed to “think on” Beethoven. For more Davidovsky, consider Arabesque Recordings Z6677, which offers several Davidovsky chamber music premieres from the Empyrean Ensemble and Susan Narucki. “Music for Ondes Martenot.” Olivier MESSIAEN: Feuillet inédit, no. 4 (n.d.); Thomas BLOCH: Formule (1995), Lude 9.6 for 9 ondes Martenot (1998), Sweet Suite for 9 ondes Martenot (2003); Bernard WISSON: excerpts from Kyriades (2001); Michel REDOLFI: Mare Teno (2000); Linday COOPER / Abdulah SIDRAN: Nightmare (1994); Bohuslav MARTINŮ: Fantasie (1944); Olivier TOUCHARD: Euplotes 2 (1987-89, arr. T. Bloch); Etienne ROLIN: Space Forest Bound (1997). Thomas Bloch (ondes Martenot), Bernard Wilson (piano), Marek Swatowski (oboe), Etienne Rolin (flute, sax. ), Michel Redolfi and Olivier Touchard (electronics); Pomeranian Quartet, Thomas Bloch Waves Orchestra, Paderewski Philharmonic Orchestra, Fernand Quattrocchi (cond. ), et al. Naxos 8.555779 (http://www.naxos.com/). 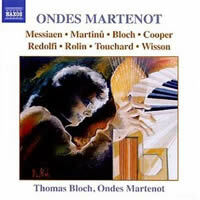 Not just for late-night college radio or fringe exotic instrument fanatics, Naxos features ondes Martenot player Thomas Bloch in a splendid recital. Bloch’s excellent notes provide a succinct history and a devoted player’s perspective. Presently the Strasbourg Conservatory’s ondes Martenot teacher, Bloch studied with Jeanne Loriod (Messiaen’s sister-in-law) and Françoise Cochet. He’s also a virtuoso on glass harmonica and cristal Baschet; see http://www.thomasbloch.net/en_home.html. An obligatory wispy Messiaen scrap for ondes with piano and a brooding Martinů septet originally specifying theremin cover the classic end of an instrument the repertoire of which begins in 1928 with Dimitrios Levidis’ Poème symphonique. Bloch’s belligerently rasping Formule emphasizes the ondes’ lowest sounds. Lude 9.6 and Sweet Suite, two works for ondes ensemble (probably Bloch multi-tracked, given the improbability of assembling nine), revel in the instrument’s potential. Several pieces highlight the ondes’ otherworldly associations: Touchard’s Euplotes 2 and Redolfi’s dreamy Mare Teno. Bernard Wisson, pianist for the Messiaen and Martinů, wrote an intriguing double concerto for himself and Bloch with string orchestra and percussion accompaniment. The three excerpts from Wisson’s concerto bespeak a confident hand, recalling Jolivet’s jazz-infused scores. Space Forest Bound, three frolicsome quasi-improvisations by Etienne Rolin, emphasizes the ondes’ metallic reverb and swooping twittering suggesting the Art Ensemble of Chicago. Cooper’s Nightmare is simply weird: an odd poem sung over Partch-like percussion and electronics, including a telephone-answering machine. 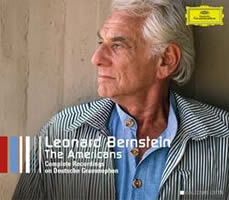 “Leonard Bernstein: The Americans.” Various composers and works. DG 474 940-2 (http://www.deutschegrammophon.com/). The sixth disc is the most adventurous, and along with the Ives, deserving of repeated plays. Concluding with a clever pastiche of whimsical Paganini variations, David Del Tredici’s elegantly orchestrated Tattoo departs from his extroverted Alice music. (In the “20/21” series, DG 447 753-2 puts Del Tredici in perspective.) Three symphonies on Naxos 8.559149 opened many ears to Ned Rorem’s wonderful orchestral palette, which deftly supports Gidon Kremer in the Violin Concerto. I’ve been told that the concerto chronicles a lovers’ passionate night. The disc concludes with an unreleased cantata by Lukas Foss, The Song of Songs. At nearly 30 minutes in a fluid, old-world tonal style, I can see why studio execs might have sat on it. This performance, featuring Sheri Greenawald and the Israel Philharmonic, is nonetheless fine. If you must have Roy Harris’ Third, here’s the one. As earlier issued, Harris’ pleaser is paired with William Schuman’s straightforward Third. The present release adds Schuman’s American Festival Overture. Gershwin’s Rhapsody in Blue, with Bernstein directing from the keyboard, drips with the tiresome immaturity of a high-school student craving the big time. Perhaps diehard Bernstein fans will love it. Matched with Gershwin’s Piano Prelude No. 2, Barber’s Adagio for Strings, and Bloch’s Schelomo, this disc will gather dust on my shelf. It’s a matter of almost religious conviction whether you prefer Bernstein’s DG or Columbia Copland recordings (SM2K 47232 and SM2K 47236). Here we get Symphony No. 3, Quiet City, Appalachian Spring, El Salón México, Clarinet Concerto, Music for the Theatre, and Connotations spread across two discs. Personally, I prefer Columbia’s cache, which includes performances under the composer’s baton. Stanley Drucker is a treat to hear in the Clarinet Concerto. Even with Bernstein at the helm, the more I hear the touristy El Salón México, the more I crave chipotle-soused Revueltas. 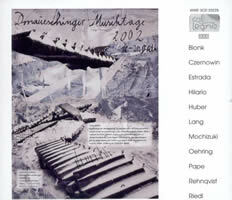 “Donaueschinger Musiktage 2002.” Various composers and works. col legno WWE 3CD 20229 (http://www.col-legno.de/). Distributed in the US by Qualiton (http://www.qualiton.com/). I’m hooked on col legno’s Donaueschinger Musiktage yearbooks, essential to anyone interested in current European trends. Col legno consistently releases an excellent package, preserving premiere performances. I view these festivals with envy, wishing I could attend in person, ideally as contributor. Vocal works must have been a theme for 2002’s gathering. Of these 11 works, nine feature vocal soloists or chorus, and four are performed by the Neue Vocalsolisten Stuttgart, accompanied by electronics, lights, and / or instruments. Only two pieces are free of electronics or other nonmusical resources. There’s something here for everyone. I’m partial to the third disc — Huber, Lang and Czernowin. Hardly characteristic, a man’s agonized scream at 7:25 in Julio Estrada’s 2002 Hum clouds any objective impression. At 28:20, Estrada’s sectional work drags us through the Mexican underworld using live electronics — who else but André Richard at the controls. While the electronics rest, the soloists rifle through a well-thumbed catalog of extended vocal techniques. Vocal music doesn’t have to be conventional to succeed on recording. Gerard Pape found inspiration in a familiar sculpture for his 2002 “The Ecstasy of St. Theresa” (Homage to Bernini). Enhanced with live electronics (Richard again), Pape uses nine members of the Neue Vocalsolisten Stuttgart to deliver appealing contours. Karin Rehnqvist’s six-part Teile dich Nacht (2002) features a “kulning” soloist who sings in a uniquely full-throated vibratoless Swedish style. Lena Willemark is accompanied by the SWR Vokalensemble Stuttgart. Several pieces are hard to grasp absent their visual aspects. Alan Hilario’s phonautograph (2002) combines five voices, percussion and trombone with four record players and electronics. Misato Mochizuki’s Ecoute (2002) features five voices and a light installation. Unless the lights make noises like tennis balls bouncing on drums or sticks rattling, there’s uncredited and unexplained percussion in this French poem’s dreamy a cappella setting. Some works behave like theatre. Helmut Oehring’s ER. eine She (aus: 5ÜNF/Haare-Opfer) (2002) for three deaf soloists, bass flute, cello, electronics and sound installation, unfolds like a creepy movie with its muffled voices and pitter-pattering cello and flute (the odd title is also struck through with double lines). Josef Anton Riedl’s vollicht aust es sa, III (2002) for speakers, flutes, percussion, four films and loudspeakers revolves through several sound poems. Knowing these composers from previous Donaueschinger bricks provides a context, but there’s still the sense that something is missing, or that these folks are taking themselves too seriously. Jaap Blonk has made a successful career indulging in self-made mouth-only noises. Back in college, I did some of that too. But in MUNDRUNDUM (2002), Blonk gets to do on a Donaueschinger stage what would have gotten me kicked out of a dining hall. I suppose I grew up on the wrong continent. Nonetheless, Blonk does it well. Go to http://www.jaapblonk.com/ and look for the Blonk Organ. The last of three discs presents compositions with orchestra, the SWR Sinfonieorchester Baden-Baden und Freiburg under Sylvain Cambreling, but nothing here is for orchestra alone. With the elusive maim zarim, maim gnuvim (2002), scored for solo quintet (oboe, tubax, electric guitar, keyboards and viola), orchestra and live electronics, Chaya Czernowin camps outside traditional borders. (A tubax is something like a contrabass saxophone.) Other Czernowin works have been presented on these pages, and this one is also representative of her intensely disjointed language. Just turned 80, Klaus Huber is possibly the most esteemed composer in this set. His 2002 “Die Seele muss vom Reittier steigen …”, for solo baritone, countertenor, cello and 37 instrumentalists, sets a poem by Palestinian Mahmoud Darwisch. Huber has been studying Arabic music for over a decade, and this intense 35-minute “chamber concerto” reflects sensitive integrity. The straining cello paired against the Arabophone countertenor is haunting. Elsewhere theorbo and viola da gamba contribute uneasiness. Bernhard Lang’s differenz/wiederholung 7 (2002) is one of a series. (A new release with three other members, DW 8, DW 15 and DW 3, was just released on col legno 20090 and will be reviewed here.) For large orchestra with loop generator, the piece builds conflicts between literal and synthetic repetition. Lang opts for a strident, atonal vocabulary. We could be hearing repeated phrases from Le Sacré or Pli selon pli. It’s refreshing to experience an orchestra employed this creatively. The computerized loops weave brilliantly through the live textures.